Who is Going to Bail it Out? We have all read the stories about very big entities failing and being bailed out – these include cities like New York, countries like Mexico and Pakistan, and corporations like General Motors and Bank of America whose businesses were bigger than the economies of many countries. All of them defaulted on their debts – went bankrupt – and were bailed out by an entity that was bigger than them, the US Government alone or in concert with other developed countries. The combination of size and of the existence of a savior, the protector of last resort, gives rise to a dilemma that is known as ‘moral hazard.’ When an entity believes its failure would damage the rest of the system and that there is someone who will not allow that to happen, then it loses the incentive to manage its risks prudently. This is quite easy to imagine. If the corner bakery fails no one would bother about it – this is considered the strength of the free market which promotes efficient competition by weeding out incompetent firms. But when General Motors fails, this logic is suspended because GM’s failures could trigger cascading failures throughout the auto industry and its service economy. Because the managers of General Motors believe this, the incentives that guide their behavior and that of the owner of the corner bakery are quite different. For example, GM managers can take outsized risks and give themselves big bonuses even when the company is making huge losses. Similarly, Pakistan’s leaders can mismanage and pillage the economy knowing American policymakers have determined that Pakistan cannot be allowed to fail – which is great for the leaders but terrible for the citizens. This brings us to a consideration of the world in the context of the global climate crisis. What can be bigger than the world? But, if the world fails, who will bail it out? Allah maalik hai is all and well but even if we fall back on that divine cushion we should remember the corollary that God helps those who help themselves. So, how exactly are we going to help ourselves in this crisis? I find useful an analogy similar to the comparison between General Motors and the corner bakery in the context of moral hazard. Think of two households; however, instead of size, now focus attention on the differences in the nature of household budgets. Suppose the monthly household budget is Rs. 20,000 that you get in cash at the beginning of the month. In one case, you know that if in a particular month you break the budget (expenditures exceed allocations), you can borrow the balance from a bank or be subsidized by your father. In the other case, if you go over budget, your house is repossessed – it’s the end of the game. The first is known as the ‘soft’ budget constraint; the second as the ‘hard’ budget constraint. As you can imagine, the softness or hardness of the household (or business) budget constraint has a great impact on individual behavior. Now apply this analogy to the environment. Clearly, our behavior reveals that we have been living in a world where we feel we are governed by a soft environmental constraint – we believe we can borrow against the future, i.e., we can have economic growth now and have the luxury of cleaning up its environmental consequences later. At the present time, the starkest example of this is China which is fueling its rapid economic growth by building more than one coal-fired energy plant a week. As a result, seven or eight of the ten most polluted large cities in the world are in China with some known and many unknown health impacts on the residents. Presumably, China believes that it can follow the path trod by the West. Western cities were environmental hell-holes well past the Industrial Revolution but most were successfully cleaned up later – the London and LA smog are still remembered by many people (the former so well described by Eliot in The Love Song of J. Alfred Prufrock). The scenario in India is very similar to that in China, only less intense, which is not for any lack of trying by the Indians – inefficiency can at times be good for you. But what if the environmental constraint is no longer soft? What if the decades of abuse of the environment (at least since the discovery of oil-based energy) have now turned it into a hard constraint? What, if that last unit of carbon dioxide emission that would trigger an unstoppable runaway process is close at hand? What if we have arrived at the tipping point beyond which all the king’s horses and all the king’s men would not be able to put Humpty Dumpty together again? This is what an increasing number of scientists are warning – we are close to such a tipping point. And this opens up a host of interesting issues. Climate change does not know any borders – in the end it will not matter whether the bulk of the damage was done in the past by the now developed countries. The innocence of the developing countries will not save them – as mentioned before South Asia would be one of the most affected regions from sea rise at one end to glacier melt at the other. So, how are developed and developing countries going to find a mutually acceptable agreement that is both fair and goes far enough to make a difference? What kind of rules and morality applies in situations like these where the whole system is at risk and there is no one to bail it out. I can’t help my mind going back to the partition of the Indian subcontinent – its leaders kept bickering and were unable to find an acceptable agreement leading to a million deaths and ten million homeless. Is human shortsightedness, false pride, sheer stupidity, and lack of feeling for ordinary people going to make us witness a replay only now on a global scale? This time there might be no one left to gloat over the superiority of one side over the other. It is useful to end with what has been termed the ‘boiling frog’ analogy: if a frog is placed in boiling water, it will jump out, but if it is placed in cold water that is slowly heated, it will not perceive the danger and will be cooked to death. Will we allow ourselves to be cooked to death? Is it hubris to think humans are any wiser than frogs? For the implications of climate change in South Asia see the special Autumn (October-November 2009) issue of Himal Magazine. For an argument that we have left it too late see this interview. For an essay competition on the tipping point, that fateful last tonne of carbon dioxide, see The Ecologist. This entry was posted on November 18, 2009 at 8:54 pm and is filed under Development. You can follow any responses to this entry through the RSS 2.0 feed. You can leave a response, or trackback from your own site. Vinod: I had bought Collapse after finishing Guns, Germs, and Steel but found the former less absorbing. GGS was hard to put down; I have to remind myself that I still have to finish C. Do you share that opinion? Yes, I do. GGS is my top favourite. C does not measure upto that. SA, if you do not have the enthusiasm for the reading Collapse fully, do read the chapter on the Rwandan genocide. There are many lessons in there that explain a lot of situations in South Asian societies. Vinod: The section on modern societies in the book has four chapters – on Rwanda, Haiti, China, and Australia. I had read the latter two perhaps because I was shying away from the gruesome accounts that I expected in the others. I have now read the chapter on Rwanda. What I found most striking was the fact that in the 1930s, the Belgians required everybody to start carrying an identity card classifying themselves as Hutu or Tutsi. Why was this necessary? Why was their need to create these differentiated identities? This is the most striking parallel I see with the British in India. The seeds of conflict are sown in this one act. Once the colonialists begin to withdraw and an electoral system is instituted to determine the distribution of power, there is little that can prevent conflict. In some places it was simpler – for example, in East Africa the Indians could all be sent out of the country as was done by Idi Amin but this could not have been possible in Rwanda. I am less convinced by the environmental argument made by Diamond – at best it can be a contributing factor to something that had already been set in motion by colonial policies. We know from South Asia where population densities are also very high that the communal conflicts were purely political. SA, I think Diamond himself makes the case that environment problems perhaps underpinned the hostilities behind the communities to an extent that is often neglected. He admits that the environment problems may be a contributory cause only. Have you read the chapter on ‘Big Businesses and the Environment’? It is a very informative chapter on the economics behind environmentally sustainable businesses? Is this the same as the problem of ‘creeping normalcy’ that Diamond talks about? Vinod: I don’t recall exactly where Diamond talked about it but it would be a logical fit in his description of situations where societies keep adjusting to environmental threats and never confront them squarely till it is too late. The two ideas seem to be addressing the same phenomenon. There are so many things in South Asia we have adjusted to that an outsider would find completely unacceptable. Yesterday there was a new report on poverty in India – I keep wondering how we can see a situation like this in front of our eyes and continue with our daily routines without registering some kind of protest. Do you need to be given permission in order to live virtuously? That may sound like a silly question, but consider the implications. In order to do and be good, do you need to be given the go ahead by some authority? Most of you I’m sure, like me, would vigorously shake your head, and respond with an emphatic “No”. We don’t need permission to seek the good, to try and do right by one another. In fact, most of us try hard to do and be good, not because we have been told to be and do so, but because we earnestly desire to live the good life. And yet! And yet, you and I know that so much of the world’s ills are caused because we ignore the good, we deny goodness and often concoct “rationalizations” to explain our intentional ignorance. For decades, thousands, even millions of Americans ignored the obvious truth about smoking, that it was unhealthy and in fact deadly, because officially the science and the politics hadn’t declared it to be such. For centuries in the Americas slavery was seen as a “necessary evil” by a majority of the population. We knew it to be wrong, but perpetuated it because our economic survival, our comfort and happiness depended on ignoring the evil in our midst. proven otherwise, we can continue believing (or pretending) that the planet is just fine, and that our consumer habits are perfectly healthy. To that I can only say, Amen. This is an interesting interview in which it is suggested that humans may have only 200-300 more years left on earth. The characterization that I found thought provoking was of climate change as the earth fighting back against a virus – the virus happens to be human beings. I don’t believe science has invalidated religion and it can’t because they are two utterly different paradigms of existence. Science has enormously increased the wonder of the religious message. It doesn’t force us to believe in it but it is compatible with it. This could be worth a discussion. Hurricane Irma draws our attention, yet again, to something that bears repetition: that those most affected by global warming’s impacts are the people least responsible for them. As Hurricane Katrina did: it was the African-Americans in the poorest neighbourhoods of New Orleans that bore its brunt the most. The only country that has – thus far – borne these hurricane assaults relatively well is Cuba. Authorities elsewhere, whether in the United States, or here in India, would do well to borrow from practices there. Having being buffeted by regular hurricanes, Cuba is now constantly, through the year, prepared for the next one. Since 1986, every single Cuban has participated each year in a two-day hurricane exercise. Hurricane preparedness is part of school curricula. Citizens are engaged in this process at all levels, each person knows where to go and there is an extraordinary level of cooperation. Particular attention is paid to the economically and physically vulnerable, and its remarkable healthcare system ensures that everyone has access to hospitals both during and after a hurricane. Not surprisingly, despite facing the brunt of Hurricane Katrina in August 2005, no one died in Cuba while 1,800 people were killed in the US, a vastly wealthier country. Having said that, Hurricane Irma is outside most people’s lived experience, so the extent of deaths and damage it may cause even in Cuba may be considerable and will only become clear over the next several days. 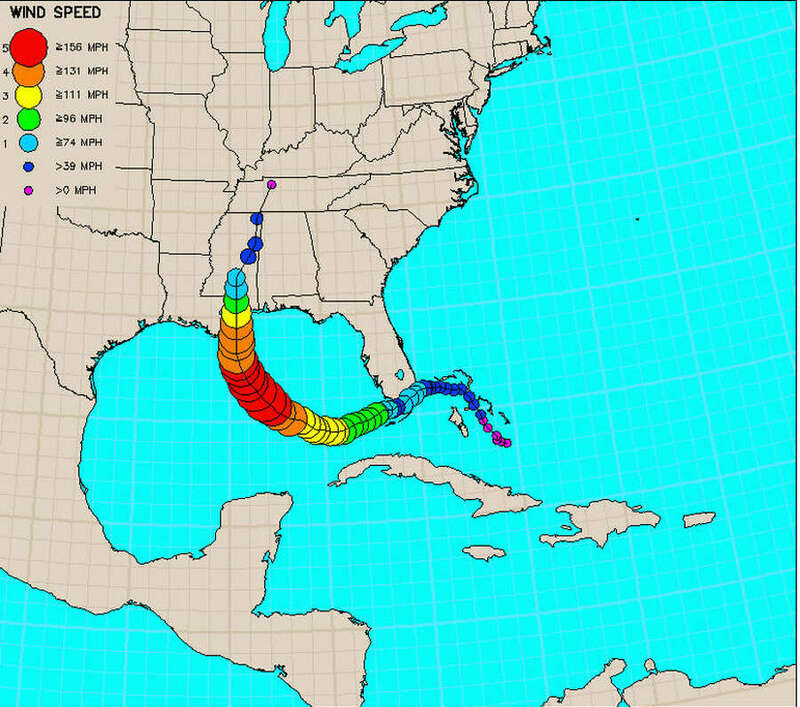 This is the trajectory of hurricane Katrina, nowhere near Cuba. Vikram: You are largely right and this is the advantage of having vigilant commentators so facts get corrected through discussion. The very nice schematic you have linked probably shows the path of the eye of the storm.